The nation has been alive with the thoughts that a giant crab could be feeding of the English coast. 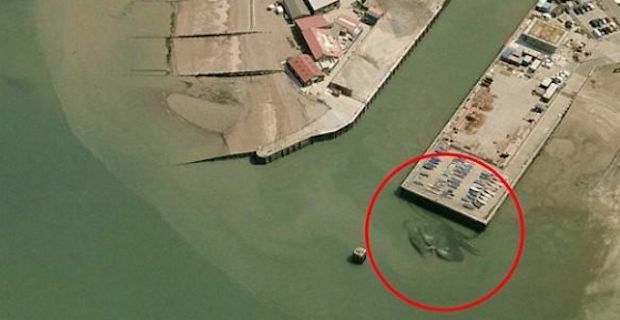 A satellite photo of a harbour, which has gone viral, is behind a huge debate over whether or not it depicts a huge 50-foot crab which has been dubbed Crabzilla. The photo shows the harbour in Whistable, Kent and in the image a large figure appears in the water, quite close to one of the piers. The harbour is a popular destination for crabbing during the summer season. A local resident also added fuel to the theory that a giant crab is hanging around by saying he spotted a large creature lurking in the waters near the shore. However, those of you who are a little worried about the possibility of crabs of a gigantic nature can rest easy as Crabzilla is highly unlikely to be a real creature. Crab expert Paul Clark of the Natural History Museum in London has laughed off suggestions that Crabzilla could be a real crab suggesting instead that an image of a shore crab has been photoshopped onto a satellite image of the harbour. Clark said of the image "I had a good giggle about it. It's ridiculous! A hoax is an understatement. A shore crab gets up to two inches if you're lucky!" The image has been traced to have first appeared on a blog called Weird Whitstable which publishes stories about all the weird and wacky things that happen in the area. The curator of the weird stories published another image back in July which showed 2 boys fishing on the Whitstable pier while completely unaware of two giant crab claws emerged from the water below them. All no doubt just a prequel to a pretty basic hoax!